Salami is cured sausage, fermented and air-dried. Historically, salami has been popular among Italian peasants because it can be stored at room temperature for periods of up to a year, supplementing a possibly meager or inconsistent supply of fresh meat. Varieties of salami are traditionally made in France, Italy, Hungary, Germany, and Spain. 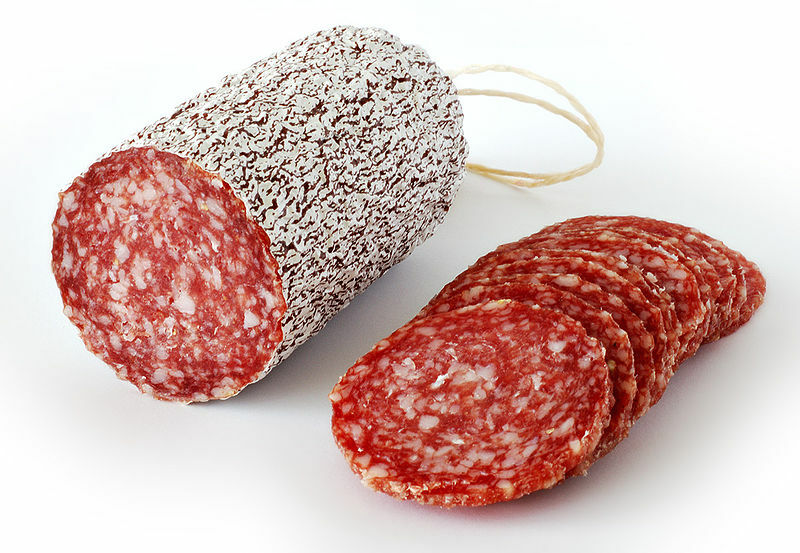 The word salami, as currently used in English, is actually the plural form of the Italian salame; it is indifferently used as a singular or plural word in English for cured meats in a European, particularly Italian, style. The word originates from the word Sale (salt) with a termination -ame used in Italian as an indicator of collective nouns; the original meaning was thus all kind of salted (meats). In the Italian tradition of cured meats the word salame soon specialised to indicate only the most popular kind, made with ground salt and spiced meat forced into animal gut with an elongated and thin shape, then left to undergo some kind of fermentation process. A traditional salame, with its typical marbled appearance, is made from one or more of the following meats: pork, chopped beef (particularly veal), venison, poultry (especially turkey), and horse. The raw meat mixture is usually allowed to ferment for a day and then the mixture is either stuffed into an edible natural or non-edible artificial casing and hung to cure. The casings are often treated with an edible mold (Penicillium) culture as well. The mold imparts flavor and prevents spoilage during the curing process. Many Old World salami are named after the region or country of their origin. Examples include Arles, Genoa, Hungarian and Milano salame. Many are flavored with garlic. Some types – including a few varieties from Spain, most Hungarian types (Pick salami), and southern Italian styles (such as those from Naples, which in turn originated American pepperoni) include paprika or chili powder. Varieties are also differentiated by the coarseness or fineness of the chopped meat as well as the size and style of the casing used. Though completely uncooked, salami are not "raw" per se; they have been prepared via curing. The term salame cotto refers to salami cooked or smoked before or after curing and it is typical of Piedmont region in Italy. This is done to impart a specific flavor but not to cook the meat. 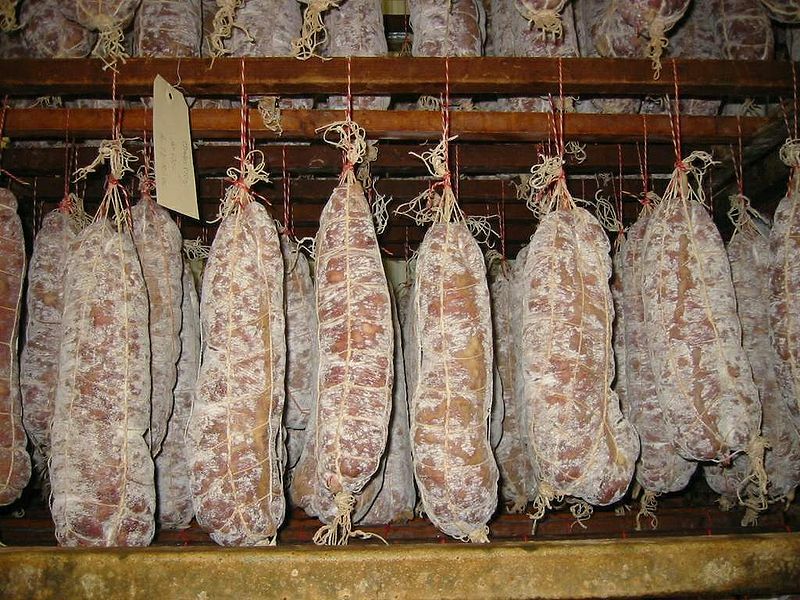 Before curing, a cotto salame is still considered raw and is not ready to be eaten. Salami are cured in warm, humid conditions in order to encourage growth of the bacteria involved in the fermentation process. Sugar is added as a food source for the bacteria during the curing process, although it tends not to be added to horse meat because of the latter's naturally high levels of glycogen. Lactic acid is produced by the bacteria as a waste product, lowering the pH and coagulating and drying the meat. The acid produced by the bacteria makes the meat an inhospitable environment for other, dangerous bacteria and imparts the tangy flavor that separates salami from machine-dried pork. The flavor of a salami relies just as much on how these bacteria are cultivated as it does on quality and variety of other ingredients. Originally, the bacteria were introduced into the meat mixture with wine, which contains other types of beneficial bacteria; now, starter cultures are used. The whole process takes about 36 weeks, although some age it more for additional taste, and some can cut it down to about 24 weeks for a sweeter taste. The curing process is determined by the climate of the curing environment and the size and style of casing. After fermentation, the sausage has to be dried. This changes the casings from being water-permeable to being reasonably airtight. A white covering of either mold or flour helps prevent the photo-oxidation of the meat and rancidity in the fat. Under some conditions the nitrate are produced by the breakdown of proteins. Salt, acidity, nitrate levels and dryness of the fully-cured salami combine to make the uncooked meat safe to consume.